A pretty patio Garden leads you to a Victorian Town House. 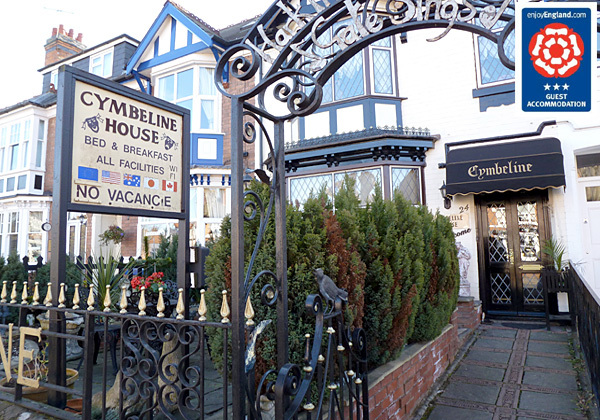 Discover Cymbeline House, a charming bed and breakfast guesthouse in Stratford-upon-Avon close to the Royal Shakespeare Theatre. Reduced rates for seniors and students in low season when available. We look forward to seeing you at Cymbeline soon. Ideal accommodation also for Stratford's shops, the Shakespeare Houses (Tudor-style houses maintained by the Shakespeare Trust). There is a hop-on, hop-off bus service that does tours of Stratford calling at the Shakespeare Houses (Shakespeare's Birthplace, Anne Hathaway's Cottage, Mary Arden's House and more).